Notes: This anime has influenced a manga by Sadamoto Yoshiyuki. This anime bears the proclaimation that it is the "Greatest Anime of All Time". Will it live up to expectations? It is 2015. Half the human race has been eradicated and biotech entities called "Angels" who are named after mythical figures are striking fear to everyone left. As a last resort, NERV, a group headquartered in Tokyo-3 who are associated with the UN, are using giant mecha known as "Evangelions". The only real problem is that only people 14 years of age can pilot them and, indeed, 14-year-olds are being trained as pilots (known as "children"). Can the world be saved by these teens in armor? Ahhhhhh Neon Genesis Evangelion. The anime known as the "best of all time". The anime that sent the Japanese Otaku world forward 77 dimensions. The anime that has a live-action remake to hit theaters within 5 years. From a distance, you might think that this anime is worth it, right? Not exactly. You see, the anime tries so hard at being "different" that the show becomes exotic to older audiences. The first thing that comes to mind is the plot. It employs about two real cliches right off the bat (The world is in danger and the only ones who can save it are unassuming teenagers). After those, it strikes off into its own world and it tries valiantly to bring you in too and chances are it will work. The plot, in any anime of normal publicity, would just be straightforward, maybe add two to three plot twists and new characters while avoiding the anime-killing Deus Ex Machina as often as possible. NGE, on the other hand, hands you a roller coaster. The plot is the car you ride on with the track being the timeline. At most, I'd suspect 5-6 plot twists in a timespan of maybe 10 episodes with newer characters being added on (namely the Angels) and being used to further the plot by some. The whole series revolves around two main angels (First Angel Adam and Second Angel Lillith) and the human race. From there, the plot is a massive track. Some will say that NGE has the most intriguing characters, which isn't too far from the truth. The main character, Shinji Ikari, is your complimentary angst vehicle. Rei Ayanami is a very mysterious person. Asuka is the main characters girlfriend (although rough and rather proud). Gendou Ikari is the big commander who you wish gets axed ASAP but doesn't happen. The rest of the characters serve as minor plot advancements and, because there are so many of them, you head starts to spin as you try to remember each one. Can this anime play instruments well? Oh yeah. NGE has one of my favorite intro themes as well as a good ending theme. The music in the middle manages to captivate and juice up some scenes to make them legendary. The soundtrack, as far as I can say, can please the people who are into the anime enough to remember tracks. This effect with the music makes NGE one of the best musically masterminded anime shows. If you find it, try the soundtrack and see if you like it, but don't rush out for the anime just yet. In an anime that relies on mecha, you'd expect the creators to make sure and triple check to see if the animation is just right. Looks like they did so here. The animation is quite nice, but not the best. For the artwork, they also had success with the careful planning and drawing, fleshing out this story as well as they can. The mecha have rather unique colors to them. The characters have color and...more color. The environment is brilliant. The only negative thing about the animation or artwork is that they seemed to overreact on violent scenes (which come in droves). The voices (namely in the dub) seem to be rather...off. Shinji sounds like he angsts even in his voice. Rei has a decent character seiyuu (despite the fact that Rei gets in about 20 words average per episode). Asuka has a voiceover that lowers the proud and rough-treating woman persona down a few, but still conveys the message long enough. The others get little screentime, but have the best dub voices (even...ick...Gendou). This anime, as a whole, is a rather decent touch of new in the lake of fandom, even though it wasn't exactly as successful in the US as it was in Japan. 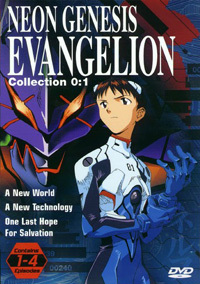 As a precaution, I'd rent the DVD first things first to see if you would like this series and, if you liked it, try another, since NGE is one of those anime that takes two to four DVDs to get an honest opinion, which is how much of it I saw.